"Deadwood" should really be called "biotope wood", as it is used as a habitat by moss, lichen, beetles and flies. Insects and birds need water areas: Water areas can be installed permanently or only temporarily on a roof using sheeting. Nesting aids foster the settlement of insects in particular. The conservation of biodiversity (biological diversity) in nature, is considered to be an important basis for human well-being. Green roofs too are capable of contributing to this; it is mainly low-maintenance roofs, that is to say, quite undisturbed green roofs, that are important refuges for various animal and plant species. Beetles, wild bees and butterflies find food and shelter there. However, the development of biodiversity depends to a great extent on how the habitats that are provided for the flora and fauna on a roof are structured. In areas where nature has been destroyed by construction works and the ground is sealed, green roofs can partially compensate for these lost green areas and can provide replacement habitats for flora and fauna. 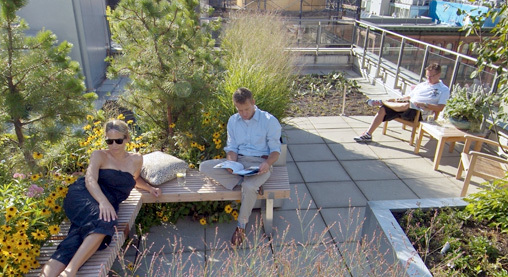 The requirement here is of course that the green roof has become permanently established and continues to thrive. This requires project-specific planning and a suitable and reliable ZinCo System Build-up. 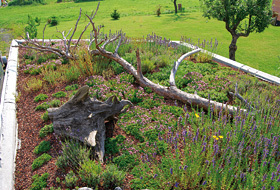 Various biodiversity modules can be used for the multi-faceted design of the green roof as a biotope. 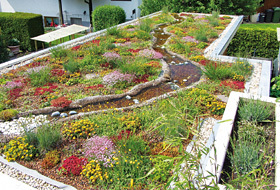 Combining a number of measures at the same time promotes and increases the biotope function of the green roof. The range of plant species, for example, can be extended by using various substrate depths. While a depth of 6 cm is sufficient for low-growing, low-maintenance sedum types and other succulents, the root area for a biodiverse herb and grass vegetation can be increased with individual landscape mounds to a depth of between 12 and 15 cm. 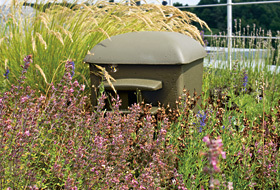 A top soil and substrate rich in nutrients, for example, the ZinCo System Substrate “Heather with Lavender”, is also beneficial. When choosing the plants, particular attention can be paid to their significance as forage plants for insects and birds. For example, Salvia Pratensis (sage), Echium, Lavender and wild Marjoram are a delicacy for bees and butterflies. Dead branches and tree trunks are a particularly valuable structural element for roofs. They are used as a habitat by moss, lichens, fungi, beetles and flies: for this reason, the term “biotope wood” appears to be far more appropriate than the usual term “deadwood”. Vegetation-free spots in the form of sand pockets and coarse gravel beds are an important enrichment, as they are used by insects and other roof inhabitants as a refuge, a breeding place and a sun trap. A series of additional nesting aids serve to encourage the ongoing insect colonisation. These include bumble bee boxes and ant stones, in addition to insect hotels for wild bees and parasitoid wasps. Finally, even temporary water areas can be included in order to improve the availability of water for insects and birds. At Individual areas of the roof, sheeting is laid out and covered with sand in order to retain rainwater on the roof for a longer period of time. Over time, therefore, a particularly biodiverse and ecologically invaluable habitat will develop. One of the most exciting green roofs in Germany is currently being installed at the IGA Berlin 2017 visitor centre; it is one of the above-mentioned biodiverse green roofs and has an area of almost 2000 m². Visitors will be able inspect this showpiece roof during the IGA from 13 April to 15 October 2017 from a platform placed beside the building. The roof is based on the ZinCo System Build-up “Rockery Type Plants” and is designed as a mosaic made up of many biodiversity modules. The design plan for this biodiverse green roof comes from the company fairplants-system GmbH and was carried out in the summer of 2016 under the project sponsorship of the IGA Berlin 2017 and the German Dachgärtnerverband e.V. (Roof Gardeners’ Association). Over time, biodiversity on a roof will increase, particularly in terms of the fauna there. The biodiverse green roof will therefore be a significant reference project after the IGA and will help to encourage more attention to be paid to biodiversity. Existing, species-poor extensive green roofs and undisturbed intensive green roofs can, of course, be upgraded at any time. In this way, the diversity of flora and fauna will increase considerably by using various biodiversity modules. Besides all that, the green roof will look even nicer. However, a solid basic knowledge of ecological relationships within natural habitats is always required when planning and designing biodiverse green roofs - an exciting and important task for planners, roof landscapers and clients alike.